The third annual Event Cinema Association (ECA) Conference took place at the new Picturehouse Cinema in London’s Piccadilly. The event has grown, most notably in the F&B (food and beverage) department, with everyone from prosecco providers to chocolate confectioners offering their wares for sampling. Yes, an opera night at the cinema is not complete without some bubbly and truffles. But there is of course much more to event cinema (note to American cousins – they stopped calling it ‘alternative content’ on this side of the Atlantic some years ago now), as was made clear in the many presentations and several strands – which made it impossible to attend and hear everything being said. But it was still a day rich in thoughts, not to mention calories and alcohol. ECA Head Melissa Cogavin was the first to take to stage to open the day. She spoke about “the journey that event cinema is on to capture the hearts and minds of the cinema going audience.” This year there was no mention of how soon event cinema will be a global USD $1 billion business, meaning that either the prediction will be missed or has been outgrown. But even with this year’s many blockbusters somewhat overshadowing event cinema, there has still been growth and progress, as Cogavin outlined. “Our industry confronts tremendous change. We need to grow smarter about how we meet our customers’ needs; need to be out in front on the experience. Amongst sessions this year will be ‘Speaker’s Corner’ – your event cinema experience this year. Industry first – best of high-end cinema food and beverage. Cinema snack has come a long way in the last few years. This year is also a feast for the eyes – [namely] the ECA awards, sponsored by Rentrak. It’s been a very busy 12 months. Tech Delivery Handbook in January. Addendum for 3D and 4K and more next year. Marketing Handbook due early 2016. Partnership with IHS and Rentrak on data collection. Includes data from 8 territories world wide. Available in Members’ section of the ECA website. Global gross revenue for event cinema has risen 32.1% since 2013. Still on upward trajectory. 2016 will see ECA having a presence at the Arthouse Convergence in Utah, US. ECA needs representation beyond UK: Jonathan Ross has been representing the ECA in the US, Nigel Dennis in UK, and next up is Germany. Overhaul of members’ area of website. Search and networking section – live today. With that the introductions ended and without the house lights ever once going down (even when content was being projected on screen) we moved on to the first panel presentation of the day. Moderator: Chris Bretnell, Creative Broadcast Solutions. This is the session the session that had everything, except maybe the kitchen sink. Or make that EVERYONE. There were nine (9!) people on the panel – plus the moderator. 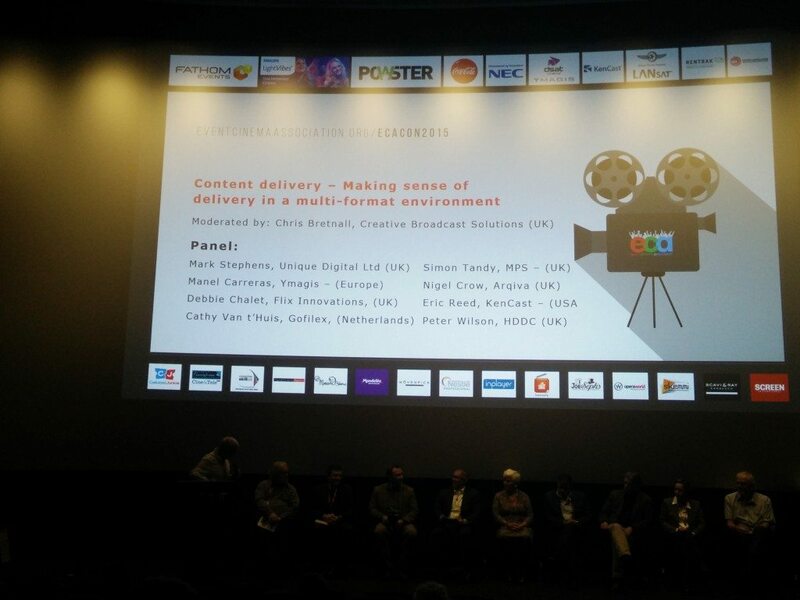 One has to wonder whether every last sponsor and/or member with an interest in content delivery was represented. Chris the moderator did an admirable job in the circumstances in letting everyone have their three-four minutes to speak. But the result was that it allowed for little more than for each speaker to say what their company did, and, not surprisingly why their solution is the optimal one. Chris – More and more people jump on bandwagons to create “content” – 3D, 4K, HDR, etc. I‘ve seen several productions wherethe qulaity is not up not scratch, not for TV and def not for big screen. Have we moved on from using consumer products (set top boxes) for live events? Are cinemas taking security concerns seriously? Chris: So homogenisation is not something we need or want? Chris: How ‘live’ are you? With the brief speech from each sponsor speaker over there was time for a couple of questions. Your correspondent put his hand up and asked about piracy. With nearly every event cinema transmission being sent out unencrypted, it should perhaps come as no surprise that pretty much every major NT Live event is available as a torrent for illegal downloading (see picture below). How long before content owners start to object? Fortunately there was somebody present from NT Live in the audience to answer. Their view is that with 652 sites for ‘Hamlet’ there is a trade-off in encrypting the content. On balance it seems the content owners would rather have the show turn up on Pirate Bay and elsewhere afterwards, than risk dark screens because of decryption issues live on the night. But it will be interesting to see how soon the business grows enough to the point where content owners start taking IP theft seriously. The second question came from Rickard Gramfors from Sweden’s Folkets Hus & Parker cinemas and concerned satellite bandwidth capacity. Manel replied that because event cinema is occasional use it should not be an issue. Though he did not say so, I guess that is particularly true in his case as Ymagis is lumbered with more transponder capacity than it needs, and contracts that it can’t ditch just yet, following Ymagis’ acquisition spree that saw it doubling up on satellite capacity almost overnight. What we learned from this session is that there are a lot of people and companies offering content delivery on a variety of platforms, but it was not a deep or meaningful discussion about the issues surrounding event cinema delivery due to the sheer size of the panel and the need to allow everyone to say their commercial-technical bit.